Polyoxymethylene (POM), also known to many by the names acetal, polyacetal and polyformaldehyde, is an engineered thermoplastic with high degree of crystallinity. It is mainly used to mold parts requiring precision, high stiffness, high impact and low friction. POM is supplied in two forms, homopolymer and copolymer. Anhydrous formaldehyde or trioxane, converted from formaldehyde, is used to produce the homopolymer. The copolymer is produced from trioxane and 1,3-dioxolane. In the latter, 1-3% of the mehtylene oxide groups are replaced by ethylene oxide, resulting in a lower melting point and reduced mechanical properties. On the other hand, this formula lowers the toxic emission of formaldehyde during compounding and injection molding by stabilizing the elimination intermediate. Due to the toxicity and high price of the homopolymer, many companies replaced it with a copolymer. However, in cases in which high impact resistance is required, the homopolymer couldn’t be replaced by a copolymer. Hence the emergence of the impact modified copolymer market two decades ago. In this market, BASF (Ultraform) and Celanese (Hostaform) are the two dominant players. Many compounding companies have tried to get into this market with no success due to the delicacy and narrow processing window of acetal polymer during compounding. 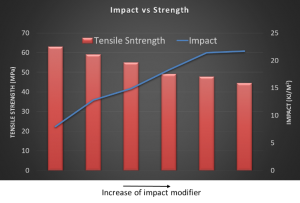 Other barriers to entry were the lack of knowledge regarding impact modifiers applicable to acetal as well as limited sources. Polyram has succeeded in cracking this family of compounds by using specific compounding parameters, extrusion screw configuration, and impact modifiers. The result is an array of impact modified compounds that compete with market leading products. 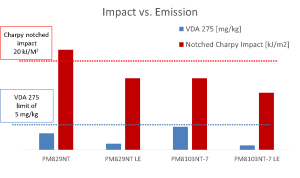 Moreover, we have developed a new sub-family of low emission (VDA 275) impact modified acetal compounds. In addition, we have developed a universal master batch (MB) based on a concentrated impact modified acetal compound, which can be added to a neat acetal polymer on a single screw molding machine. We use regular MB feeding system to achieve a desired impact modification. This approach has a positive effect on the final mechanical properties, as the neat POM used for dilution will not undergo extrusion and degradation. Using the IM-MB also allows for considerable cost savings.